a mining engineer in the Russian military. that established it against a flurry of competing claims. 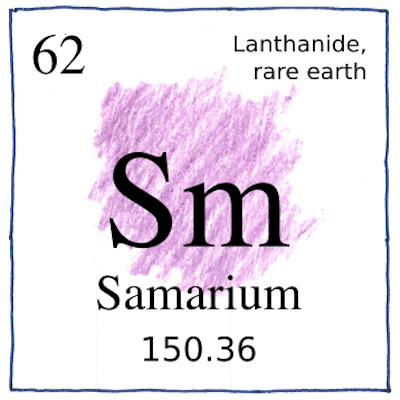 in samarskite, but it was a mix of terbium and holmium. another in samarskite but it was holmium. including samarium, neodymium, and praseodymium. and the other . . . well, more on that later. of mischmetal in lighter flints. an efficient Lewis acid catalyst. involved in DNA replication and repair. but an ideal is reachable. It’s only a coincidence that Lecoq discovered both gallium and samarium, and that the atomic number of samarium is exactly twice the atomic number of gallium. The history of the discovery of samarium shows us that this stuff isn’t easy. Rare earths are placed in the same locations in the periodic table because they are chemically very similar.